NASA's InSight lander will study the deep interior of Mars to help understand the early history of all rocky planets, including Earth. Your name could land on Mars a year from now aboard NASA's next Red Planet mission. The space agency is inviting people around the world to submit their names to be etched on a silicon chip that will be affixed to the InSight Mars lander, which is scheduled to blast off in February 2016 and touch down on the Red Planet seven months later. "Our next step in the journey to Mars is another fantastic mission to the surface," Jim Green, director of planetary science at NASA Headquarters in Washington, said in a statement. 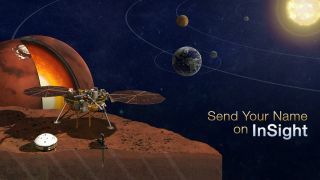 "By participating in this opportunity to send your name aboard InSight to the Red Planet, you're showing that you're part of that journey and the future of space exploration." People who submit their names will earn "frequent flier" points that reflect their participation in NASA exploration missions. Last December, more than 1.38 million people got points when their names flew aboard the first test mission of the Orion capsule, a spacecraft that will help NASA astronauts get to asteroids, Mars and other faraway destinations. The next opportunity to rack up points will come in 2018, when Orion and NASA's Space Launch System megarocket launch together for the first time. That unmanned flight, known as Exploration Mission-1, will send Orion on a seven-day trip around the moon to test out many of the capsule's critical systems. The $425 million Mars InSight mission — whose name is short for Interior Exploration using Seismic Investigations, Geodesy and Heat Transport — will use several different science instruments to study the Red Planet's interior. For example, the lander will use a seismometer to characterize "Marsquakes" and deploy a heat probe that will hammer itself deep into the ground. InSight's observations should reveal a great deal about Mars' internal structure, such as the size and state (i.e., liquid or solid) of its core, and shed light on the formation and evolution of rocky planets in general, NASA officials have said.